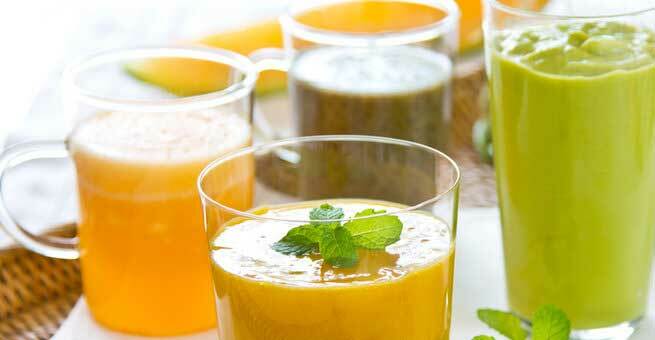 If you think that a juice is same as a smoothie, then you are mistaken to quite an extent. Of course, both are a drinkable version of our beloved fruits and veggies. However, there is enormous difference between the two. The difference starts from how they are made up. Basically, a juice is made up by extracting juice from a solid fruit or vegetable. In this process the fruit and vegetable fibres are the residual waste. And in order to make juice, you need to use a juicer. While, if you want to make a smoothie, you have to take whole fruits or vegetables. These fruits and vegetables are then blended by crushing them into a semi liquid form. You can use a blender or mixer to make a smoothie. When we try to find out the better and healthier version, we do not say that the other is unhealthy or harmful. Unlike juice, when you make a smoothie you do not discard any part of the fruit or vegetable. Thereby, you always try to keep the nutritional value intact. However, in case of juice the important element i.e. the fibre content is discarded. A glass of smoothie when taken in place of food can serve as a good filing. Moreover, there are more options of mixing other healthy and nutritive ingredients like peanuts, avocado etc. with a smoothie to increase its sustenance. In case of juice, it can satiate your thirst but you will still be hungry. The important feature of fibre is that it absorbs the sugar content. On the contrary when you juice up a sweet fruit or vegetable it becomes concentrated sugar due to lack of any fibrous element. While smoothie can reduce the sugar absorption due to the fibre present in it. Although not so important but to make a smoothie is less cumbersome as compared to making juice. Also when you make juice, the after cleaning process is also elaborate. Of course, by now you would have realised the difference between the two and which one is a healthier version. Both have their own benefits. It would be unjust to say that juices are unhealthy. However, one can conclude that smoothies give the actual benefit that is present in a fruit or a vegetable to our body. But that should not stop you from having a glassful of juice! We hope by reading this you will be able to make an informed decision while selecting a smoothie or a juice.